Gnarls Barkley: Relegated to the alternative sidelines while the Chicks cleaned up. Does pop music have standards to define quality? Standing in line at the bank the other day, I heard "Can't Fight This Feeling" by REO Speedwagon and made a mental note that it's surely among the worst hit records ever made. Suddenly, the guy in front of me started happily whistling along. The Recording Academy sets standards with its Grammy Awards, mixing the big industry class of film's Oscars with the silliness of the People's Choice Awards. They have a storied history of blowing it. By contrast, the Rock and Roll Hall of Fame, whose induction ceremonies air on March 12, has since 1986 been building an authentic museum of great music in Cleveland. The Dixie Chicks swept the top categories at the 49th annual Grammy Awards, winning for album, record and song of the year. 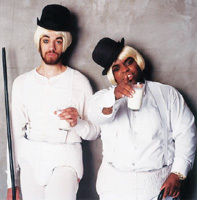 Their 2006 work was worthy, but the sweep stiffed obvious "Crazy" by Gnarls Barkley, who merely scored for best alternative album. Then again, the top nominees weren't much to chose from--who in his right mind thought Justin Timberlake might have made the best album of 2006? Grammy mishaps are legendary. The fake group Milli Vanilli won best new artist in 1989 (an award rescinded in scandal), while a washed-up Jethro Tull won the first best metal award in 1988, the year Metallica hit the Top 40. The Academy often seems to recognize great music by mistake: Elvis Presley only won for two gospel records; James Brown won just twice in R&B categories; and the Rolling Stones only won for best rock album and video for the marginal Voodoo Lounge as late as 1994. The vast list of all-time greats whom the Academy has stiffed is egregious. Think Diana Ross and/or the Supremes ever won? Or huge hit-makers Creedence Clearwater Revival? Never. And neither have such giants as Chuck Berry, the Beach Boys, Curtis Mayfield, Led Zeppelin, Sam Cooke, the Who or Neil Young. These Grammyless greats are all in the Rock and Roll Hall of Fame, along with the best, most important artists of rock's first four decades. The Hall is built to reward longevity and impact, as inductees become eligible 25 years after their first record is released. Along with essential artists, the Hall also inducts such nonperformers as producers, songwriters and media personalities, and even has categories for sidemen and early influences. As a result, the Hall's history lesson includes key figures like label owner Sam Phillips, blues wailer Bessie Smith, songwriter Doc Pomus, promoter Bill Graham and our own Johnny Otis. Not surprisingly, three of this year's five Hall of Fame inductees have never won a Grammy. R.E.M. and Van Halen both won in 1991 in minor rock categories. But Patti Smith, Grandmaster Flash and the Ronettes (or, for that matter, Phil Spector) have never won. It may be unfair to compare the Hall's test of time to the Grammy focus on the popular moment, but the Academy has a proven knack for ignoring contemporary critical consensus. By the way, REO Speedwagon never won a Grammy. But even with that in their favor, they have a snowball's chance in hell of getting in the Rock and Roll Hall of Fame.